Posted May 14th, 2015 at 11:36 am. 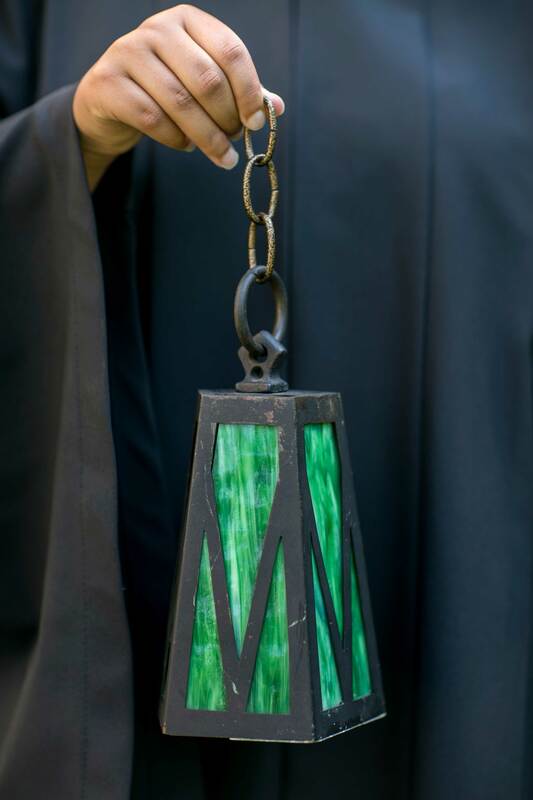 The more than 300 undergraduate members of the Class of 2015 and the graduating members of Bryn Mawr’s Graduate School of Arts and Sciences and Graduate School of Social Work and Social Research will receive their degrees at 2 p.m. on Saturday, May 16. Convocation is scheduled for Friday, May 15. Billy Collins, former Poet Laureate of the United States, will deliver the Commencement address. For complete details and information about the weekend’s events, go to the Convocation and Commencement homepage. Continuing their academic studies in Philadelphia are mathematics major Danielle Weismann, who will pursue a master’s in biostatistics at the University of Pennsylvania. Swetha Narasimhan, a math major with an education minor, will join her at UPenn, where she will pursue her master’s in secondary education with a specialization in math. Growth and Structure of Cities major Xue Jin is doing the 3-2 program for a master’s in city planning at PennPlanning with a concentration in urban design. Before going to UPenn for her extra year, Xue will intern at AECOM (an architecture, engineering, landscape and planning firm) in their San Francisco office. She will be joined in the UPenn program by fellow cities major Jacqueline Slaby, who will concentrate on sustainable transportation and infrastructure planning. Jacqueline will spend the summer back at home in Battle Creek, Mich., interning with Battle Creek’s Chamber of Commerce and volunteering with the local YMCA to tutor residents who are pursuing a GED. Anthropology major Linda Yean will return to her hometown to pursue a master of public health degree in community health and prevention at the Drexel University School of Public Health. Math major Zhen Xu will attend Johns Hopkins University in Baltimore, where she will pursue a master’s in finance. History of art major Joana Yasui will be in New York at Sotheby’s Institute of Art, where she plans to earn a master’s in art business. Graduates headed to the New England area include psychology major Mikah Farbo, who will attend Harvard’s Graduate School of Education for a master’s in education. Also Harvard-bound is Russian major Sara Powel, who is enrolled in the Ph.D. program in Slavic literature. Quela Jules, an English major and education minor, will pursue a master’s in early childhood education through the Teach Next Year program at the University of Massachusetts, Boston. Psychology major Phoebe Jordan is going to the University of Wisconsin-Madison to pursue her Ph.D. in school psychology. Headed west is Wei Liu, a history major with an education minor, who will attend Stanford’s Graduate School of Education for her master’s in education. Anthropology major Kailina Mastroianni is moving to Seattle to pursue a master’s degree in acupuncture and Oriental medicine at the Seattle Institute of Oriental Medicine. Biology major Rachel Hager will be entering a Ph.D. program in ecology at Utah State University. Danielle Preziuso of Upper Chichester, Pa., didn’t travel far to attend Bryn Mawr but is making up for it in graduate school. The mathematics major is going to Reykjavik, Iceland, to pursue a master of science degree in sustainable energy at the Iceland School of Energy. History major and English minor Stephanie Bredbenner will pursue a master’s in archives and records management at the University of Liverpool in the U.K. English major Angela Rosenberg plans to earn a master’s in digital humanities from Trinity College in Dublin, Ireland. Carmen Lai, an international studies major with a cities minor, came from Malaysia to attend Bryn Mawr and this fall she’ll be in the U.K. to attend graduate school at the University of Cambridge. Many Bryn Mawr students will be entering the work world after graduation. Anthropology major Syona Arora will reside in Philadelphia and work as a management trainee at world-wide industrial supply company McMaster-Carr. Health and medicine is an area many Mawrters are entering. Biology major Sruthi Buddai will intern at Doylestown Hospital while she continues her work in coordinating a clinical research study in a diabetes prevention program at the Temple University Center for Obesity Research and Education. Chemistry major Eun-Young Park will return home to Honolulu, Hi, where she will be a research assistant at the Hawaii Center For AIDS in the University of Hawaii’s John A. Burns School of Medicine for this upcoming year as she prepares to apply for medical school. Chemistry major Stephanie Yang will return to her home state of Maryland to work for the National Institutes of Health. Biology major Hena Cebecci will work at the pharmaceutical research company ICeutica while applying to medical school. Several Mawrters will be starting careers in the Big Apple after graduation. International studies and Spanish major Emily Chan will be a presidential associate at Estée Lauder Companies. Fellow international studies and Spanish double major Sophia Dauria will be a paralegal at Cleary, Gottlieb, Steen & Hamilton for the next two years. She will be joined at the firm by comparative literature major Adriana Volterra, who will also work as a paralegal. Alyssa Marie Young majored in psychology, minored in education, and received certification to teach pre-K through eighth grades; she will be teaching at The Brearley School. Math major Kelechi Njoku has been accepted into the Tech Connect program at JP Morgan, where she will be working as a technology analyst. Those going on to careers in teaching, education, and academia include Emma Kioko, who will move to North Carolina to work at UNC Chapel Hill in the Institute of African American Research. Education major Chandrea Peng will be joining the Boston Teacher Residency. Psychology major Sarah Friesen-Johnson will take part in the Capital Teaching Residency with KIPP D.C. Leslie Castrejon, who graduates with a major in Spanish and minor in education, will work with students in Philadelphia’s public school district through the City Year Philadelphia program. Mawrters traveling abroad or returning to their home outside the U.S. include anthropology major Livi Huval, who will return to Japan as an assistant language teacher through the Japanese Exchange and Teaching Program. Xinyin Huang, a sociology major and cities minor from Shenzhen, China, will head to Shanghai to work as an educational consultant; she will help students apply to colleges abroad. French major Anna Marrinan will be an English teaching assistant in Lorraine, France, under the French Consulate. Bryn Mawr students who have received fellowships include Rose Pierre-Louis, who will be a Newman Foundation Fellow at the Connecticut Public Broadcasting Network in Hartford, Conn. Psychology major Kristina Xiang will serve with City Year as an AmeriCorps member in San Jose, Ca., where she will tutor and mentor students in underserved schools. Biology major Ekaterina Vlasova received a Watson Fellowship to travel to Germany, India, Nepal, Thailand, Japan, and Peru, to explore the connection between contemplative practices and healing. Theater major Camilla Dely also received a Watson; she will travel to Sweden,Turkey, the United Arab Emirates, Indonesia, and Brazil, to learn from women artists. Orsola Capovilla-Searle, a double major in mathematics and physics, received a National Science Foundation Graduate Fellowship and will study math at Duke. Rebekah Adams, a sociology major with a minor in Africana studies, will study Swahili in Tanzania for a year as a Boren Scholar; she will then assist a professor at the University of Cape Town, South Africa, with a research project on food security in sub-Saharan Africa as a Commonwealth Africa Scholar. Russian major Mikayla Holland has also been awarded a Boren Scholarship. She will study Russian language at the Flagship Language Program at Al-Farabi National Kazakh University in Almaty, Kazakhstan. Political science major Gabrielle Crossnoe will be a Micah Fellow in Boston, where she will participate in a year-long program of direct service, community organizing, and social justice activism. Anassa Kata to all the members of the Class of 2015!